Description: The Physical map of North Dakota showing major geographical features such as rivers, lakes, mountains, topography and land formations. North Dakota is placed in the Upper Midwestern area of the United States, circumscribed by the Canadian regions of Saskatchewan and Manitoba to the north, the conditions of Minnesota to the east, South Dakota to the south, and Montana to the west. 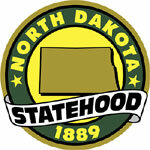 North Dakota is found in the U.S. area known as the Great Plains. The state shares the Red River of the North with Minnesota on the east; South Dakota is to the south, Montana is to the west, and the Canadian territories of Saskatchewan and Manitoba are north. North Dakota is arranged close to the center of North America with a stone marker in Rugby, North Dakota denoting the "Geographic Center of the North American Continent". The western 50% of the state comprises of the bumpy Great Plains, and the northern piece of the Badlands to the west of the Missouri River. The state's high point, White Butte at 3,506 feet as well as Theodore Roosevelt National Park. The focal area of the state is partitioned into the Drift Prairie and the Missouri Plateau. The eastern piece of the state comprises of the level Red River Valley, the base of frosty Lake Agassiz. Lakes in North Dakota are Lake Sakakawea extending to the North West, Audubon Lake, Lake Alice, Lake Irvine, and Devils Lake in the North East. While Lake Oahe near Bismark, Long Lake, Round Lake are found in the South. Eastern North Dakota is general level; then again, there are critical slopes and buttes in western North Dakota. The greater part of the state is secured in prairie; yields cover the majority of eastern North Dakota however get to be progressively inadequate in the middle and more distant west. Counties and Road map and map image of North Dakota.